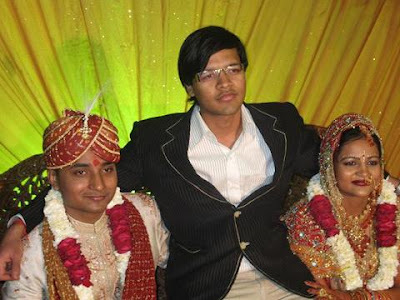 Well blogging this time to cherish one of the greatest moments .. i went home , back to delhi on Jan 20 2007 ,,.. .the occassion , my cousin sister's wedding. the day of glory was 23rd of 1stmonth of year 0f 2007. My flight was on morning of 20th jan , and as usual , it took off after a delay of 1 and a half hour , and reached delhi , to be greeted on airport by my mom and two cousins. Well , with a typical beard , and long hair , my mom was not very happy with the look i carried , a typical mafia one ...well , if she did not approve , it had to go , and all my styles , which only i think looked cool , were off . i went back home , and met the most beautiful diamond in my life , my sister . Well she was not at all in holidaying mood , as was going to have her semester exams from the next week. Then there was a lot of shopping in the air , and moving about here and there and telling tales from bangalore and mysore. Then it was time , and i dont know when those 3 days vanished in thin air and the day of marriage came. 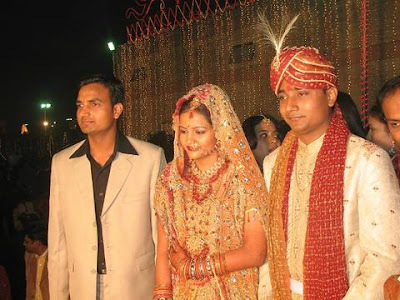 the marriage was arranged in a farm house , and all arrangements were complete. for all i can say is touchwood , and remember this song from movie dhadkan as she came to the wedding ceremony . 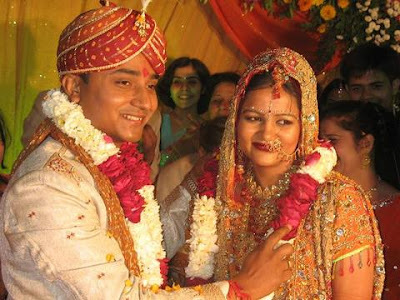 ..
Zameen per Falak Se Pari aa Rahi Hai"
Here's the couple i was boasting for such a long time .... deepak and anjali . And would I be doing injustice if i forget to have Ravi in the frame. With good sense of humour and rocking the party whole night long , he is brother of the groom ..